Slovakia is located in Central Europe, bordering on Austria, Czech Republic, Poland, Ukraine and Hungary. The mid and the North of the country is mountainous (Carpathian curve), while lowlands are typical of the South and the East. 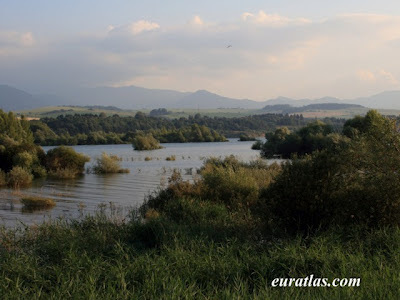 The most important Slovak river, the Danube connects the capital city Bratislava with two capital cities of the neighbouring countries - Vienna and Budapest. Slovakia’s unique natural phenomena are represented in the UNESCO List by caves and abysses of Slovenský kras karst and by Dobšinská ľadová jaskyňa cave. In 2007 the Carpathian primeval beech forests of the Bukovské vrchy and Vihorlatské vrchy Mts. in the east of Slovakia were added to this list. Also, three localities from Slovakia were inscribed to the UNESCO List of cultural monuments already in 1993: Castle of Spiš and its environs, Banská Štiavnica and Vlkolínec. In 2000, the historic town Bardejov was added and in 2008, wooden churches of the Slovak part of Carpathian Mountain Area. The emission standard of PM10 particles is exceeded in an increasing number of regions. Elevated concentrations of heavy metals in the air occur in some locations, generally Pb goes down, others are comparable with previous years or go slightly down. Some of the monitored water courses (especially smaller streams close to pollution sources) remain in the categories of highly and very highly polluted. Also, some sections of important water courses have long exhibited elevated concentrations of specific pollutants. The quality of surface and ground waters continues to be affected by extensive pollution sources; 54,5 % of the area of agricultural land can be classified as “vulnerable areas”. A number of water reservoirs are endangered by eutrophication. A decline in animal density per ha, reduction of pesticide use and improvement in substitute pesticides have also led to a notable improvement in water pollution. Likewise improved manure technology has led to improved water quality. Drinking water is strictly controlled. Soil erosion caused by high rainfall and floods is a major problem. As a result, vast sedimentation is taking place in many lakes to the detriment of the ecosystems of the land. Separation of waste solids is still on very low level. Landfilling remains the most usual form of disposal: 86 % in 2004 of municipal waste. Damage to forests in Slovakia from pollution is high. Large scale agriculture also decreases the habitat of wild living organisms. Drainage of soils destroys populations of wetland plants and animals. The number of forest fires has rapidly decreased compared with previous years. Agricultural fields are integrated to large areas causing obstacles for spreading plants and animals and causes water and wind erosion. 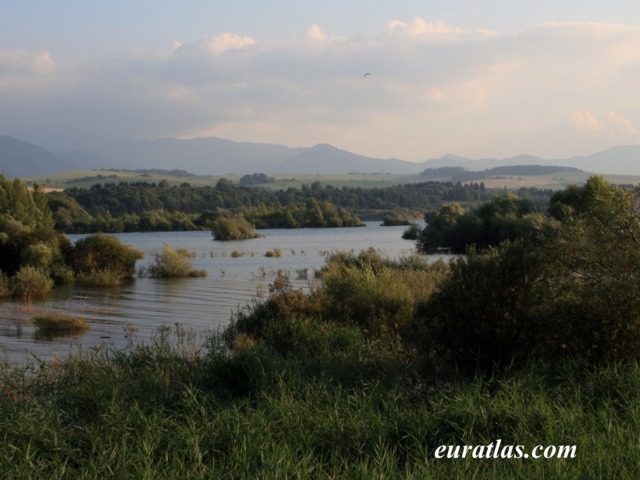 As of 2001, 22.1% of Slovakia's total land area is protected. In 2001, 8 mammal species, 4 types of birds, and 11 plant species were endangered. Threatened species include the Danube salmon, marsh snail, and false ringlet butterfly. Slovakia has experienced decreased river flows in many areas, while also getting hit more frequently by localized flash flooding due to extreme weather events. As a consequence of climate change, river flows are expected to continue to decrease in the summer, while the frequency of flash floods is expected to rise. Increased pressure on water resources is expected, and will impact different sectors of the economy. Declining river flows will reduce the country's potential to generate hydro electricity. A decrease in surface, ground and soil water will put pressure on the agricultural industry, and scarcity of irrigation water is likely. Civil society in Slovakia remains one of the most vibrant in Central Europe. In 2006, the Ministry of Interior listed more than 22,000 non-governmental organizations. According to the data from the Slovak Statistical Office, NGOs employ more than 1% of the working population and are contributing approximately 1.5%to the GDP of the country. Opinion polls show that Slovak citizens’ involvement in voluntarism and charities is systematically increasing, with donating even more popular than volunteering. Moreover, the image of NGOs in public opinion is prevailingly positive. Financial assistance from Western democracies to both private and public NGOs has been instrumental in developing a vital civil society in Slovakia since 1989. However, 2003 brought unprecedented changes to legislation impacting civil society. According to an amendment to the law on income taxes, tax-payers in Slovakia could dedicate 1% of their income tax to non-profits. In 2003, parliament approved an increase of the possible tax dedication to 2%. In 2004, a further amendment gave companies permission to dedicate 2% of their tax to civil society organizations, consequently opening new possibilities for sustainable development of Slovak civil society sector. According to OECD there are about 15 environmental taxes in Slovakia, among which 6 regard fuels and vehicles, 3 regard air pollution, 1 regards water, 4 regard waste, while the remaining one refers to installation of nuclear equipment. There are also 6 environmentally motivated subsidies with the purpose to: motivate vehicle owners to forward out-aged vehicles for proper (environmentally friendly) treatment and to gather resources for their disposal; improve the state of environment by supporting small environmental projects; achieve compliance with EU Directives concerning environment protection; support environmental investments, which would be otherwise impossible or very difficult to proceed; improve the environmental quality of products; and continually improve management of environmental problems. As of 2009, the ratio of environmental taxation stood at 1.9 % of GDP, the third lowest value in the EU, 0.7 percentage points below the EU-27 average (2.6 %). Revenues from environmental taxation have been declining from 2004 mainly due to shrinking receipts from energy taxation. CSR in Slovakia is relatively new. International companies and non-governmental organizations have been its main proponents. They have striven to create conditions and initiatives to motivate businesses to apply CSR principles. In Slovakia, it is largely major companies with foreign capital that are familiar with the term corporate social responsibility. For the wider public and Slovak businesses, however, CSR is a term that is still virtually unknown. That is not to say that Slovak companies do not act responsibly; in fact, there is a tradition of corporate social stewardship. Many firms financially support various charity and/or community projects; they communicate with the public and have strong employee protection policies. They thus practice various elements of corporate social responsibility, even though they do not call it as such. Understanding of CSR in Slovakia is often reduced to philanthropy or charity for several reasons. Philanthropy as a concept has existed in Slovakia for longer than that of CSR. Moreover, philanthropy is less complex and diverse, making it more easily understood and implemented. Philanthropic activities are also more visible to the public than CSR activities, making it easier to generate support for it. CSR awareness is relatively low within the local business community. Some companies are not aware of the term but in fact practice CSR. Other companies recognize the term and even claim to practice CSR, but in reality they are engaged in philanthropy or charity, or they have simply assigned their 2% tax dividend to an NGO. Few companies can claim activities in the field of CSR, and what they are doing is actually CSR in its broadest sense.